With this special offer I understand that I’ll receive the Manipulation Manual, including any Bonuses all for a one-time fee of only $9.95! I understand that if I’m not satisfied with my results, I have your personal 8-week unconditional money-back guarantee that ensures I have nothing to risk! I Want To Offer You An Even BETTER Deal! For years I’ve sold my complete Hypnosis Manual set for upwards of $50 for the digital versions and $80+ for the hard copies. But as a one-time offer to YOU, I’m willing to give you ALL of the Manuals (as downloadable PDF files) Plus bonuses .At LESS THAN HALF PRICE if you order them RIGHT NOW! Each Manual sells for $19.95 in electronic format, so you are getting a value, when you order from this special offer. Talk about power…The Hypnotic Influence Blueprint contains insights into every imaginable form of Hypnosis. Included are how to conduct stage hypnosis. Here is just some of what you will learn. Yes Al ! 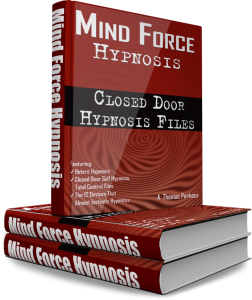 I Want The Entire “Mind Force Hypnosis Manual Set”(Including All The Bonuses..A Total Value Of Over $238.10! )For The Low One Time Offer Of Just…$59.85$14.95 More (Sells Everyday for whole lot more)! I fully understand I get everything promised and exactly what I need to start creating incredible persuasive and hypnotic power, and I’m ready to reserve my copy TODAY for the system immediately. I also understand and agree to all other Terms and Conditions detailed on this page. Some will do just the Manipulation Manual. But if you’re looking for my personal insights into how to covertly persuade and hypnotically influence, then I highly recommend the Hypnosis Manuals & Videos and Audios to get the most from your study of this fascinating material. !